Plenty of nail polishes sound good enough to eat (can we offer you a "Marshmallow"? Or how about some "Jam ’N Jelly"?) But—poisonous odors aside—there’s a whole lotta stuff in there you don’t want to ingest (or breathe in for long periods of time, for that matter). 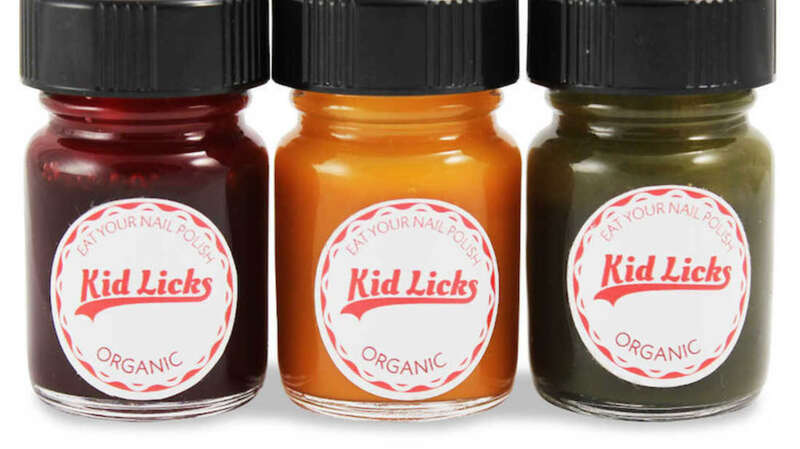 The exception: Kid Licks, a new brand by parents who sought a safer alternative after their four-year-old daughter developed an affinity for painting her digits. The resulting product, which Amara and husband Josh Kroot developed in their kitchen, is organic and totally edible. Its consistency is just like your favorite drug store staple—it even dries like it—but Kid Licks can be taken off with good old fashioned soap, water, and a little bit of elbow grease. So far, the nail polish (marketed to kids and kids-at-heart “zero and up”), comes in three shades that sound more like your local smoothie shop’s offerings than anything a preschooler might reach for. Would-be nail artists can choose from Barley Green Grass, Beet Red, and Sour Carrot Orange—which is to say, while kids can eat it, they probably won’t want to.